PHOTO PROVIDED "Lossless No. 1," part of the film and video installation by Rebecca Baron and Douglas Goodwin currently on view at George Eastman House. Limited as we are, humans will forever grasp at some intangible and possibly nonexistent mode of perfection — a perfect experience, or perfect conveyance of action, of story, and of meaning. As we use technology to hook and drag ourselves forward in time, it provides enhanced tools for interpreting and conveying our experiences. But sometimes, as technology becomes more widely available, sacrifices in quality are made in order to spare expense. In "Lossless," an installation of experimental film and digital works by filmmakers Rebecca Baron and Douglas Goodwin, acquired in 2011 by George Eastman House and currently on display in the museum's Entrance Gallery, the unconsidered space between technological touchstones is explored through bits of visual fascination. As we continue our unending correction of our tools, we seldom linger to consider the transitional spaces between what we used before and our bright current manner of interpreting our time here. There is more information floating around in energetic wavelengths than we have the ability to focus on or take in, and though our recording devices may act as extensions of our senses, only a limited output of information can be experienced in the present, digital format. Baron and Goodwin point out that everything is organic and temporal. While may believe each new media pushes us further toward an immortal record of art, their work underscores that when we transfer data to a new mass-produced and ultimately fragile state, some of it is lost, compressed, distorted. In this exhibit, the artists dwell in the playground territory between states, invisible to and disregarded by most. In "Lossless No. 1," Baron and Goodwin attempt to visualize the difference between film and digital video by isolating a particularly powerful sequence of 48 frames from "The Wizard of Oz," scanned from a 35mm film print, but also extracted from a DVD release of the film. The artists then digitally subtracted the DVD frames from the scanned film frames, leaving an image that reveals the difference between the analog and digital formats. 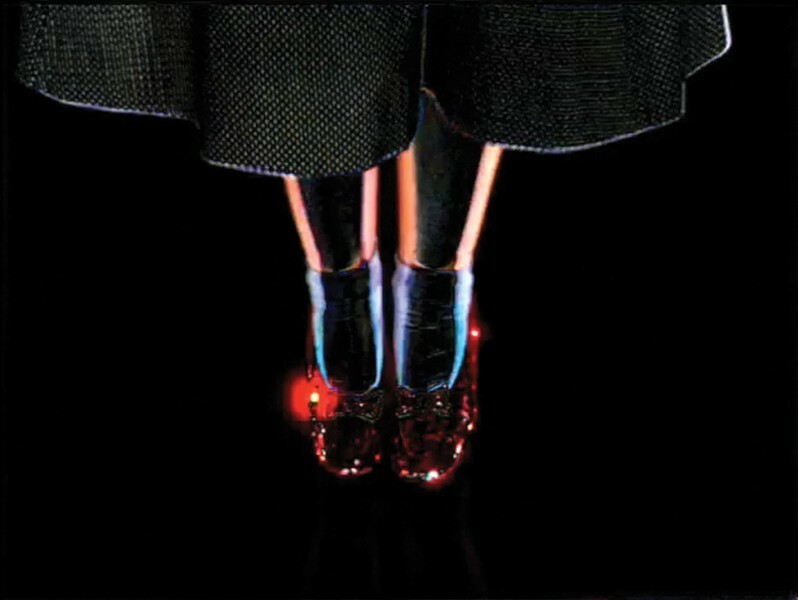 The result is 31 seconds of Dorothy's ruby slippers clicking together, over and over, the shoes, her legs, and her dress a shimmering beacon, an immortal moment of intense wishing. "Lossless No. 2" is three minutes of heavily compressed digital video, from Maya Deren and Alexander Hammid's 1943 film "Meshes of the Afternoon." Haunting scenes flow together as if a surreal painting has come to life. The dreamlike movement of a woman's arm unzips the scene to reveal her face and bust, and a loaf of bread becomes a tunnel that a figure walks through, all to buzzing, beeping, jarring segments from Teiji Ito's 1959 soundtrack, edited by Baron and Goodwin. Compression lends a similar effect on "Lossless No. 5," which is a three-minute digital video of a water ballet film by Busby Berkeley. Bodies become flowering abstractions, blooming and undulating forms slowly twirl and revolve. One scene resembles a chain of duplicating bacteria, snaking around each time it doubles its numbers. The watery, almost kaleidoscopic effect is ethereal and mysterious, slow flowing movements giving the sense of a sacred ritual. In "Lossless No. 3," the keyframes — reference frames that define the starting and ending points of smooth transitions — from a digital version of John Ford's 1956 Western "The Searchers" have been removed, resulting in a fluid movement, "unanchored from the original photographic print," per provided information. Horseback riders slide along the landscape, trailing pixilated fragments of themselves, as if leaving traces of their presence on the scene. A man turns his head and his lips run along his face as if smeared with make-up, blocky clouds slide across the sky, and splashy cubes are kicked up when the riders cross a river. Perhaps the most abstracted result of Baron and Goodwin's toying with digital media is "Lossless No. 4," derived from Ernie Gehr's 1970 "Serene Velocity." The picture has been removed, leaving only the vectors that describe apparent movement within the frame. Here, a black void is filled with a grid of white dots from which white lines are anchored and shift about hypnotically. This is the digital medium, stripped down to its skeleton and exposing the formal qualities of the film. It is much like encountering not a foreign language, but an inhuman language; a language meant for machines, though created by humans. Essentially, Baron and Goodwin create shifting pop-art portraits of the white noise of our electronic experiences. They succeed in pointing out to us what has become commonplace, yet unrecognizable as interesting phenomena to consumers, just as Andy Warhol recorded and distorted the logo- and icon-riddled banality that had spread like rot over an America drunk and lulled by the war teat. This work smartly reflects the mesmerizing dance and confounding role that media performs for us. The nature of everything is to pass away; the nature of humans is to resist that. We may never find the trick or solution to this great dilemma, but we continue to pursue it in stops and starts, like that pair of ruby heels, clicking away wishes the dark.